Branch collars are where trees seal seal off injuries. Picture, in your mind’s eye, a young tree growing towards the sun. Every so often, a branch starts to emerge from the side of the thickening trunk. This is what they do. Now, picture a side branch that grows in a way or a place that requires its removal. Where do you make the cut? Tree pruning is an excellent way to maintain good tree health and increase production. Doing it incorrectly, however, can kill your tree - and it's all about the branch collar. Cut the limb flush with the trunk. Paint sealant over the wound. Cut straight through larger limbs. In each of the above practices, more harm is being done than good, and all because of the branch collar. What is the branch collar? 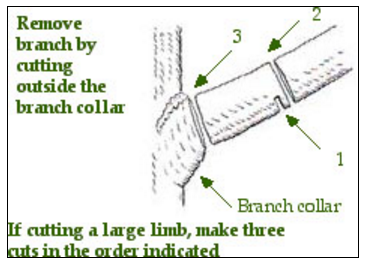 The branch collar, or callus roll, is the raised area that surrounds the base of every branch. This where tree growth changes from trunk to branch. You may also see a wrinkled area where a branch meets the trunk. This is called the branch bark ridge. But the branch collar is where trees produce the protective callus. Damage the branch collar and infection is sure to occur. If you want to learn more about branch collars at the cellular level, check out Horticultural Science’s pdf Tree Branch Attachment to Trunks and Branch Pruning. In it, Alex L. Shigo describes how branch tissues develop, bringing the xylem and phloem along for the ride, to feed the new branch. Fascinating stuff! When a limb is cut, the tree seals off the area with a dry covering called a callus. The callus is generated in the branch collar and slowly works its way toward the center of the cut. If the branch collar is damaged, the tree cannot seal the area off properly. Often, this is how moisture enters a tree, leading to rot and decay and, potentially, the death of a tree. Cutting the limb flush with the trunk removes the branch collar altogether. Painting sealant over the wound interferes with the drying process, trapping moisture inside. Cutting straight through larger limbs risks tearing down the side of the trunk. Instead of doing it the Wrong Way, you can put the branch collar to work for you and train your tree to grow better and stronger.